The House Hostel has been pioneer in this concept of accommodation. Being one of the very first hostels in Bariloche, we keep growing and improving ourselves to give the best service. We are now proud of being a clean, fun and full of services option. We offer nice rooms with comfortable beds, in shared bedrooms of 4/6 people, or double, triple and quadruple private rooms for those who need more privacy. 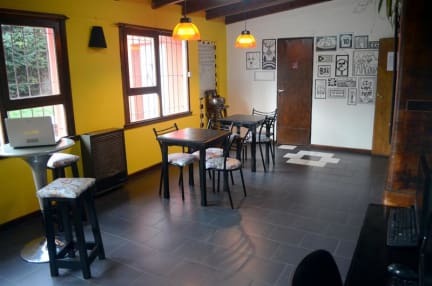 The House Hostel Resto & Bar is more than an accommodation place, it’s a meeting place where you can make friends and share your holidays. We offer different places where you can relax and meet people from around the world. Enjoy our beautiful garden with barbecue area, full equipped kitchen, and comfortable living room. And the most important one, come to our own bar if you wanna enjoy happy hours, delicious homemade food and beer, music, drinks, and a lot of fun!! We offer free Internet access with WIFI area in all the hostel and bar. Laundry service is available at reception. Luggage storage and car/bike parking. Breakfast included!! You will be able to enjoy a complete self-serviced breakfast including: fruits, toasts, the typical Argentine dulce de leche, jams, butter, coffee, tea, juice, chocolate, cereals, and bread to start your day the best way!! The House is attended by its owners and our staff of travelers like you, people who enjoy life and want to share their experiences. We’re happy to help you and recommend the best options of Bariloche to make memories that will last forever! You can enjoy great tours, including rafting, different treks around the mountains with panoramic views, four trax, mountaineering, biking and horseback riding. We highly recommend them to those with spirit for adventure. We also can provide you information about the city, culture, places of interest, gastronomy and night life.